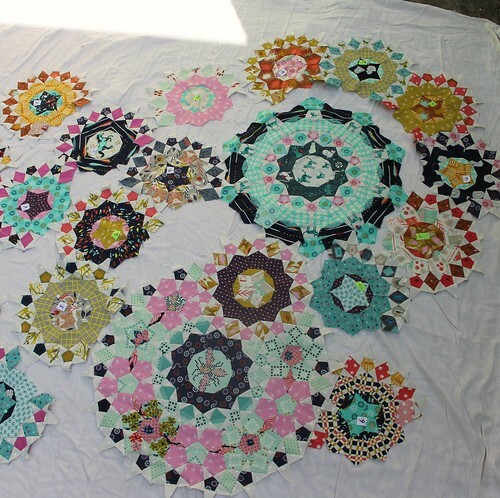 When I told my brother we wanted to have kids but didn’t feel quite ready, he said, “You’ll never be ready, you just have to be brave.” I think the same advice applies to starting a La Passacaglia quilt. This gorgeous quilt pattern has been very popular and I’ve admired it for several years – HOWEVER I also thought that everyone doing it was totally out of their minds! What changed? Well, when my daughter was about a year old she was a terrible napper. But she would nap in the car. So I started to spend a lot of time sitting in the car! I started to have an itch for a hand sewing project to keep my hands busy. I decided the people working on La Passacaglia had the right idea. And then I became obsessed with this beautiful quilt. Now my daughter naps in her own crib, but I am still sewing! I sew listening to audiobooks and while watching TV. My hands have stayed busy. 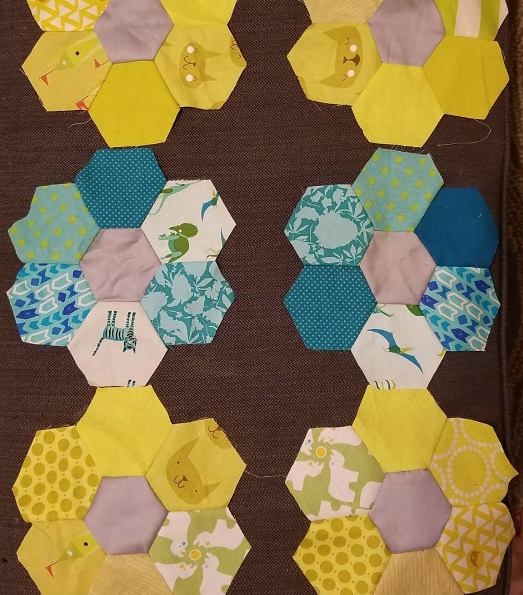 That was January 2016, I am now about halfway finished piecing the top, and I thought I would take a minute to outline the choices I made when I got started, because I know that getting started is the hardest part! 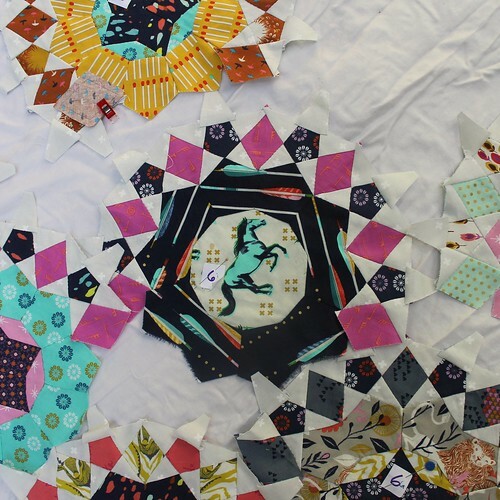 Karen at The DIY Addict has a series of great blogs about her process with La Passacaglia, as does Wendy at her blog if you are looking for more ideas! 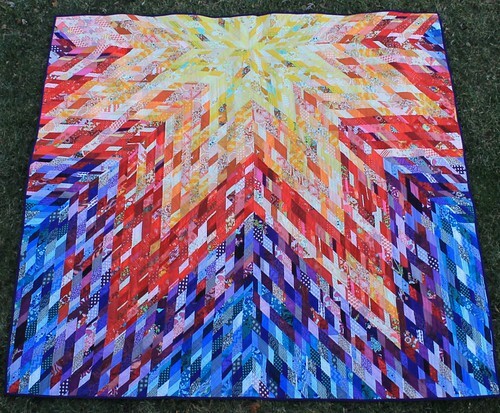 I think it goes without saying to buy the book and support the artist who designed this incredible quilt! Unfortunately the book isn’t super common and it is kinda pricey – but a great source is the inklingo site, where I also got the inklingo program which allows me to print the pieces directly onto the fabric. I did a lot of google image searches for these quilts, and joined a facebook group for people working on the quilt, and I thought about what I liked best. I love pretty much everyone one of these quilts, but some definitely speak to me more than others! I made note of some of the design features I liked best. For example, I tended to like ones with single color stars. I liked quilts that had surprising color schemes. I liked ones that had a lot of strong color contrast. I liked fussy cutting, but it didn’t feel important to me that every piece be fussy cut. 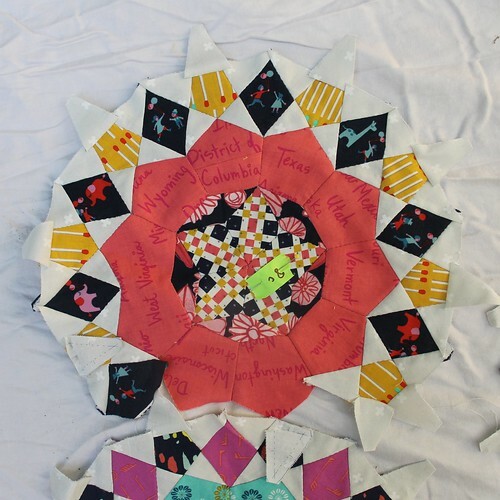 This quilt is a very personal project. It takes a lot of time! You are going to have to like it! For me, I wanted a hand sewing project I could take with me to the park, and I didn’t want to spend hours and hours cutting the fabric. It may seem ridiculous to want to do a “quick” version of a labor intensive project like La Passacaglia, but hear me out! Since having a kid, it’s hard for me to get a lot of time alone in my sewing room -which is where I would need to be for fussy cutting and fabric choices. 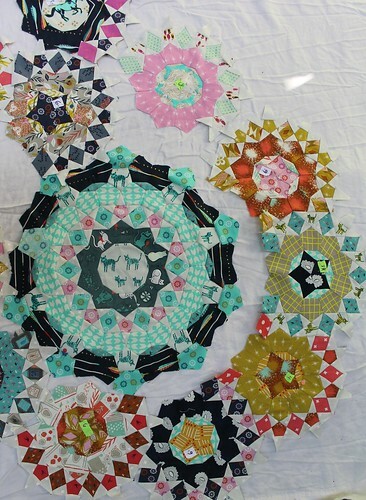 I talked to a few people who spent hours picking fabrics for each rosette! I think that is awesome, but it was way too intimidating for me. I was more interested in having a portable project than spending hours cutting out the fabric. 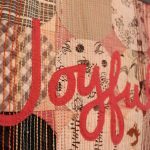 I chose to use one line of fabric – specifically a fat quarter pack of Cotton and Steel. I have bought a few (haha more than a few!) special novelty prints as Cotton and Steel have come out with new fabrics, but the majority of the quilt has come from this one pre-cut box of fabric I got on clearance at Craftsy. All my fabrics are Cotton and Steel, which helps me know the pieces will all coordinate. I decided to make all my stars one color (white) – this saves me the time of choosing special fabric to match each rosette. It also allowed me to cut out all my stars in bulk. There are some drawbacks, since light colored fabrics kind of wash out next to the stars, but on the whole I’ve been really happy with this choice. As a side note, I needed about 2.5 yards to cut my stars out – though I probably could have been more efficient, it is a good ballpark estimate. I chose to use Inklingo. In this method you can print a large number of pieces directly onto your fabric and then cut them with a rotary cutter. The designer has taken great care to create options that use your fabric as efficiently as possible and has great tutorials for how to get started. If you are not fussy cutting, it’s a very efficient and accurate way to create your pieces. For my stars, I cut and printed about 500 at a time in a few hour sessions. Inklingo is worth it for the stars alone in my opinion!! I minimized fussy cutting. I have done some fussy cutting, especially of the cute animal shapes which are the main theme of my quilt. But for fabrics that don’t have a novelty print I haven’t worried about it as much. I do think my quilt might look a little more sharp or tidier if I had fussy cut even the smaller, non-feature prints, but I like the way it looks! I combined templates to make larger shapes. I was inspired by East Dakota Quilter to do this. I couldn’t actually use her template because my shapes are different sizes (I am doing the slightly larger 1.5″ Pentagon option (in the book the pentagons are 3 cm)) but I loved her method of combining shapes in order to use specialty fabrics with a larger feature print. I have done it with the centers of the rosettes and also by combining two pentagons. I’ll warn you though – combining two pentagons creates a concave intersection and you will have to clip your seams. For example, in the mustang rosette below, the center is one piece, and the outside pentagons have been combined so there are only 5 pieces instead of ten around the center. I had to clip the seams at the concave point where I combined the two pieces. I used fray check and I think it will be perfectly stable. Step 4: Choose a sewing method! 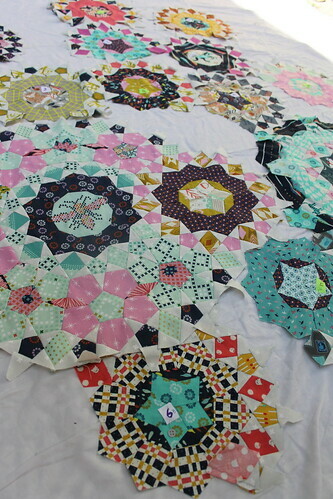 I’m not English Paper Piecing (EPP), which is the most common way people approach the quilt. 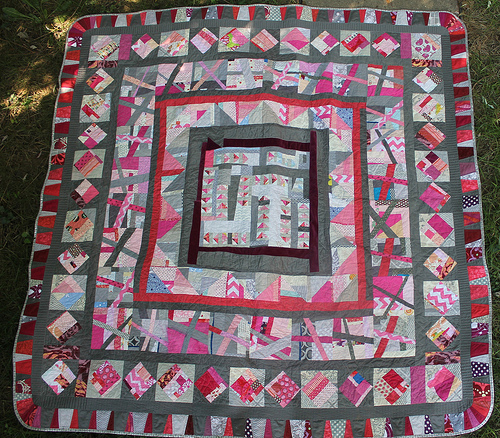 Willyne Hammerstein, the quilt designer, does not use EPP either. 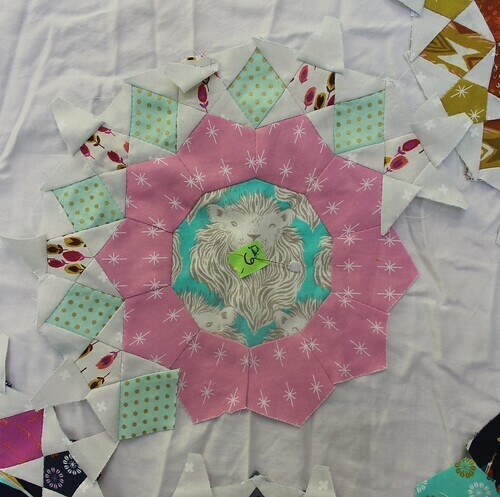 There are definitely advantages to EPP – some people think it’s more accurate (Note; I haven’t had any issues with accuracy with hand piecing so this isn’t a concern for me – all my pieces fit together beautifully so as far as I can tell, it is accurate enough for me). Certainly EPP looks nicer in progress, and the seams are more stable and protected during sewing. With EPP each seam is folded around your piece – with hand sewing, your seams are exposed until you sew the next layer of pieces to them. You can see this in the picture below – the seams are raw and if you aren’t careful the star points can get crumpled. I will say I haven’t had any issued with my seams fraying, but I do worry about them stretching out on the bias with all the handling the rosettes get. But, to me, EPP seems like a bit of extra work, slightly extra expense if you choose to buy pre-cut pieces, and somewhat less portable since you have to mess with your paper pieces and your fabric. Another difference that mattered to me is that I find EPP a little more stressful on my hands. Possibly that is just lack of experience with EPP, but since I have some repetitive stress pain in my hands, that mattered to me. Since I had very little experience with EPP I felt like I may as well try hand sewing using a running stitch along lines drawn (or printed) onto the fabric. Each options has merits, and again it comes down to your personality and preference. Another option for hand sewing without EPP is using stamps like these which is cheaper than Inklingo and wouldn’t have the learning curve of figuring out the software and printing set up. I will not try to explain the ins and outs of this program, because there are so many great tutorials and videos on the website. I will say that I am incredibly impressed with the genius that went into designing this program! I am also impressed with the very high level of customer service she provides. I learned so much about hand sewing and the process of making a La Passacaglia by working my way through this method. It is a bit of a learning curve – what I did was sit down at my desk with some scrap fabric one evening and spent about 3 hours watching the videos and experimenting with the printer till I had it all figured it out. There were some very frustrating moments, but after this process I really felt ready to dive in to my La Passacaglia. 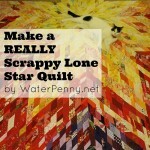 I try to be a thrifty quilter generally – I work a lot with scraps ! 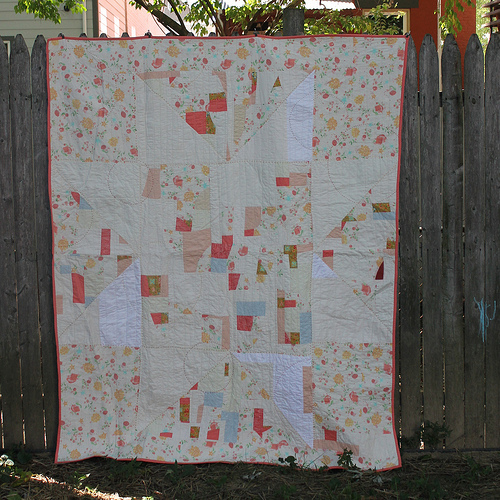 At first I was determined to squeeze my whole quilt out of my set of 40 fat quarters that I had purchased for around $40 on clearance. But one fabric at a time, a special fabric for fussy cutting has become a “must need.” As I get closer to having all the rosettes done and see the quilt all laid out, I think of colors or themes I want to add, and realized I want to add more little animal fabrics. I am at this point, terrified to add up the cost of the fabric I’ve purchased for this project! It is definitely the most I have even spent on a quilt, so don’t say I didn’t warn you. 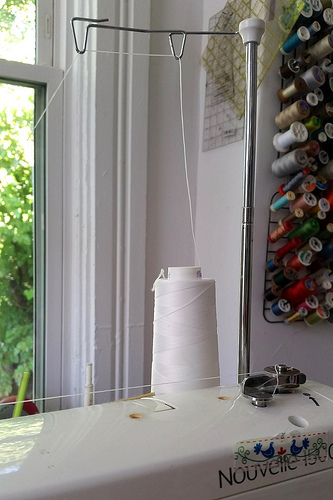 Generally a fat quarter or even an eighth of a yard will do for a fabric – unless you are doing a very particular fussy cut. I just bought my last half yard of fabric – some little bunnies that I HAD TO HAVE because I realized last night my quilt needed bunnies. It just does. Step 6: Just Get Started! Like I said at the beginning – you’ll never be ready you just have to start sewing! I suggest starting with a few of the smaller rosettes – or just make a handful of centers, then add a few stars here and there. You’ll get a feel for the color combos you like and the method that works best. If you don’t like your first couple attempts – make a pillow with them! So really you have nothing to lose – get started! I am still one of those who thinks she will never attempt a project like this – but your comments are very interesting. I think your decision to use white for the stars is working out well – it makes your quilt seem ‘lighter’ and less busy than some I have seen. Thanks for the shout (thediyaddict) This is great information. Love what you have been working on!!!! Wow, that’s the more complete tutorial I’ve ever seen. I’m currently doing the Passaglia on the 2nd book. I don’t use Inlingo but I trace all my pieces on the fabric with homemade templates. I was not going to EPP all those pieces. But it really takes a lot of different fabric. And I find it really difficult to keep organized. Good luck with your project, I gave myself 2 years to complete the top: I’m half done and 6 months left. Stay with it and you’ll get it done! It takes a lot longer than most quilts, but it’s well worth it. I don’t know how I missed this post earlier, but thank you for the shout-out on my pentagon template! Also, while I was surprised to find I love EPP and that it’s the best fit for me – even though I normally hate any sewing that “takes too long” – I was very interested to read about your method of printing on the fabric and sewing along the printed lines. One of my favorite things about this quilt is learning different techniques and reading about different approaches. I sure wish I had thought to keep all my star points the same color when I started. Oh well! This is a wonderful blog post. I’ve been building up to start my La Passacaglia quilt for 3 months and this is the most comprehensive and practical advice I’ve seen yet. Thank you!